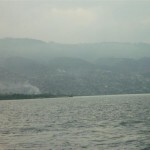 Around 6am Saturday morning Haiti came into view. It is estimated 10 hours before we can start taking care of delivering the containment for Haiti and meeting with the other geologists. 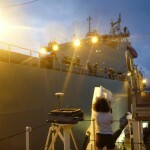 The science will most likely begin Sunday when we can begin surveying. The captain isn’t comfortable with us beginning our surveying at night since we really don’t have a good sense of what obstacles we could encounter (i.e., pinnacle reefs, marine terraces, ect) and with all the equipment that is attached at the sides and the stern, it could be an expensive disaster. Beginning on Friday, it really felt like we were in the tropics. It is warm with a perpetual sea breeze. We all went out on the deck after dinner to watch the sunset on Friday night. 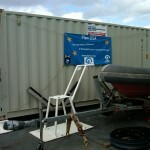 I have uploaded pictures of some of the equipment we will be using once we arrive in the Haitian waters. 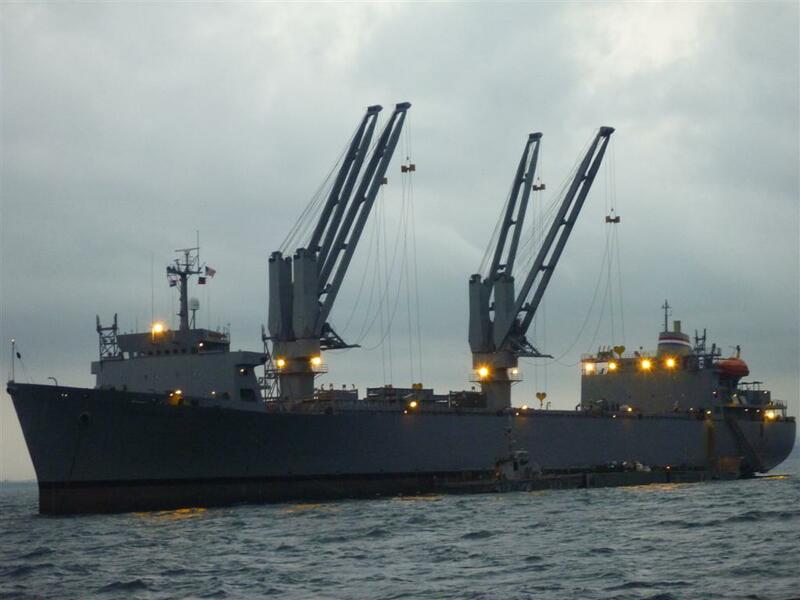 We got our clearance just yesterday to enter these waters. We have begun to test the various instruments en route to ensure they are properly functioning. The yellow fish-like device is called a CHIRP. 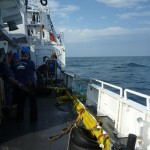 The CHIRP is towed behind the boat (aft) and provides us with a continuous profile of the seafloor and its subsurface. It is important for noting subsurface features that will help us hone in on regions of subsurface faulting. A transducer in the CHIRP emits a frequency range between 0.5 and 12 kHz. As geologic materials in the subsurface and on the surface have different physical properties, the receiver inside the CHIRP will receive the signal at different velocities depending on the material. 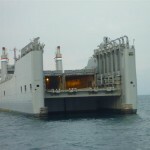 The multi-beam, a 240 kHz system, is mounted on the yellow pole alongside the starboard side of the ship. It is useful in up to 450 m water depth and creates a map of the seafloor; aprofile extending about 250 m at either side of the boat. The side-scan sonar compliments the multi-beam as it provides a crisper resolution of areas of interest. 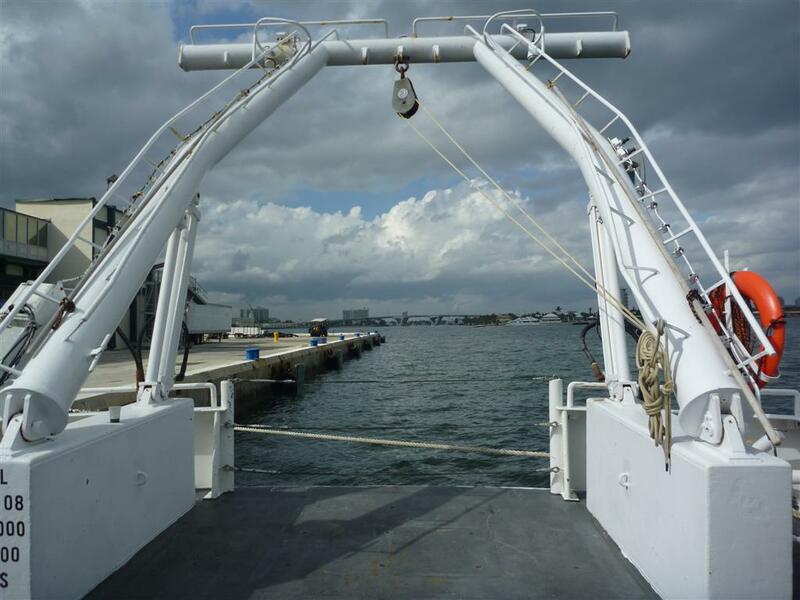 Mapping the seafloor will help us determine ideal sites for collecting sediment for studying the sediment record to eventually develop a paleoseismic history of Haiti. The long silver pole is a gravity core. Inside of it is a clear plastic tubing, which will bring home with us to understand the geophysical properties of the individual cores. 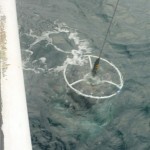 The corer is attached to a wire and lowered from the A frame (picture) of the boat until it is dropped at a rapid speed to ideally recover about 8 ft of sediment. 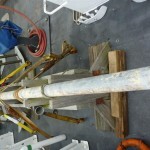 The other type of coring device you see if called a multi-corer (pic). The multi-corer can potentially collect 4 cores at once which is useful for understanding a greater spatial area as opposed to one spot location of the gravity corer. 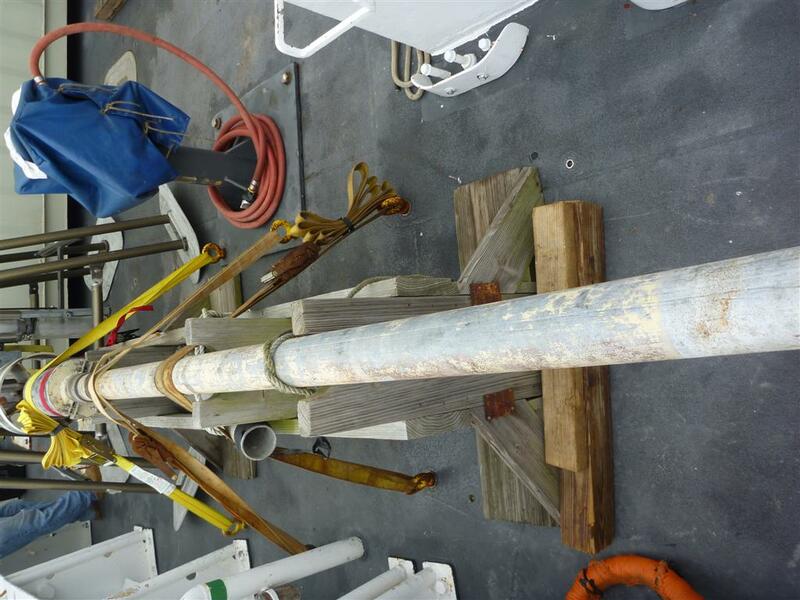 The cores collected from the multi-corer will help us determine the age of the sediments and how fast they have been accumulating (using radionuclides). We will begin processing the multi-corer cores on the ship (cutting it into cm intervals and bagging them for later analysis). 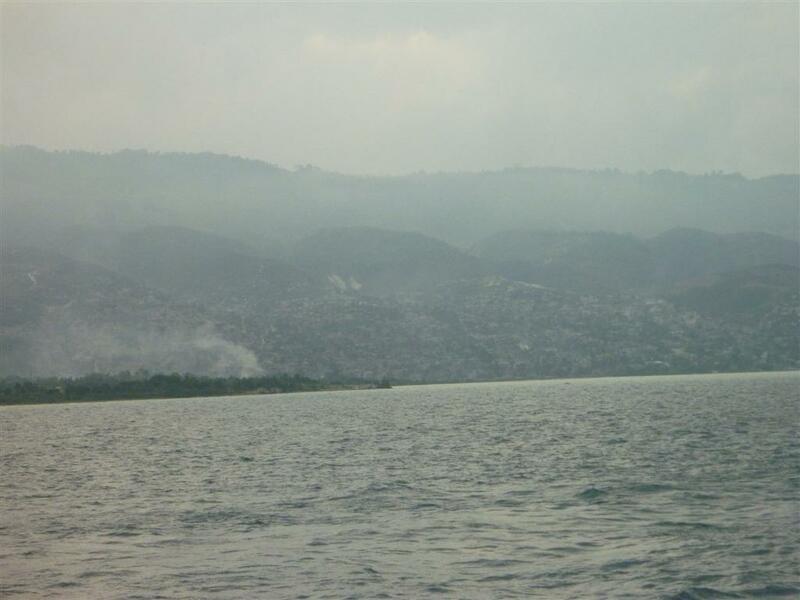 The sediment samples will be used to understand changes in lithology (meaning a variation of different sediment types provides us with information on how the environment has changed in the marine environment adjacent to Port -au Prince). 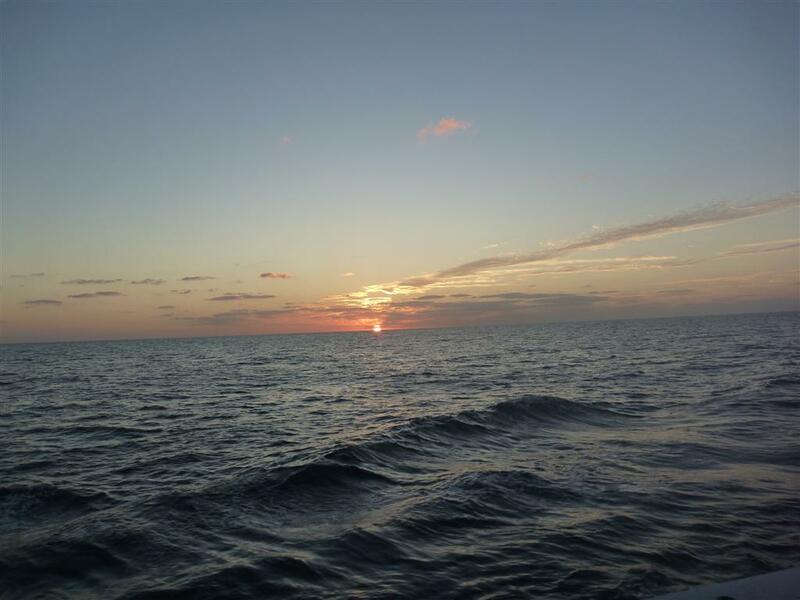 Additionally, we will use surface samples to help us focus on an area that records recent disturbance (i.e. earthquake) using short-lived radioisotopes. We are still transversing through the Bahamas. 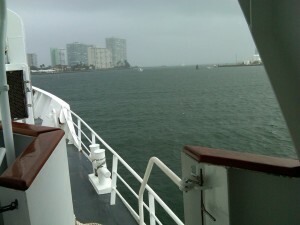 Eleuthera and San Salvador were both visible from the ship. Now we are sailing in between Crooked and Long Islands and it is finally feeling like Caribbean weather. The sun is shining and temperatures around 80 degrees. I love the peacefulness of standing on the deck, watching the ocean, and feeling the sea undulate below my feet. I am wearing a sea sickness patch, which I am guessing is working because we have been in pretty high seas all day and last night and I feel ok; able to read and work on the computer no problems. The maximum roll of the boat thus far has been about 18 degrees. This may not sound like much, but until you experience it you realize how significant an 18 degree roll truly is. 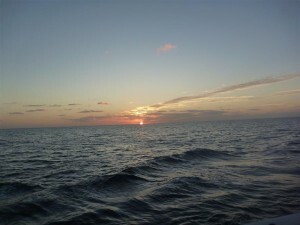 At times if felt like the boat may tip over, although that’s highly unlikely in these seas due to the size of the keel. During meetings everyone is flying out of their chairs and inadvertently diving toward the person across from them. 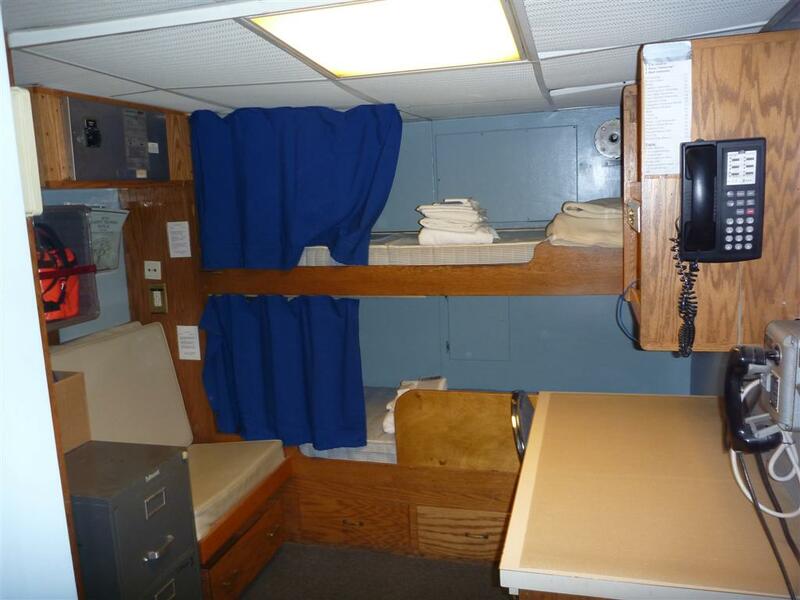 Sleeping on the top bunk was interesting as well, as I had several close calls of nearly falling out of bed (no guard rail) throughout the night. 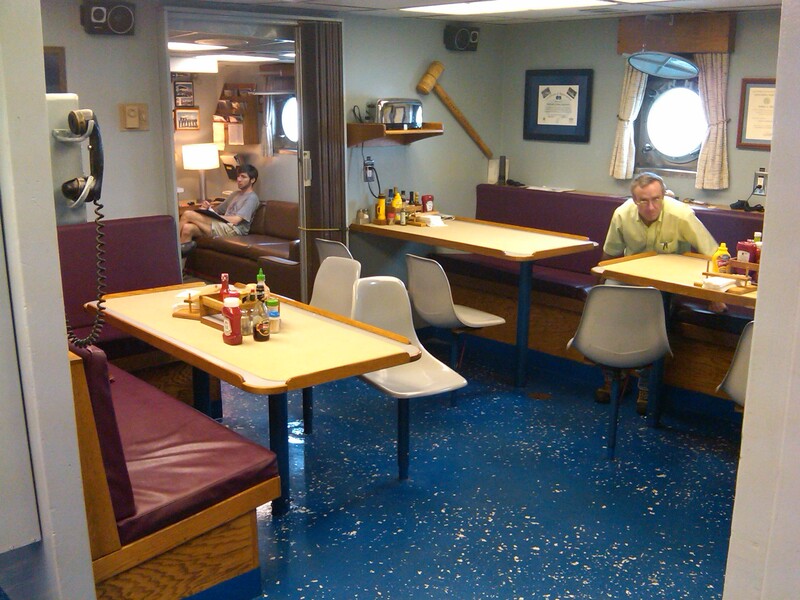 They have an exercise bike on the lowermost deck today, which I was able to complete a nearly full workout until a high angle roll caused the entire bike to topple over with me on it. Owe! Showering is also a challenge. You must hold on to something at all times. We are all so excited to arrive to Haiti and begin collecting information, as all the data that we can gather will be mostly new . The chief scientists have devised a sampling and survey plan. 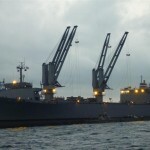 They drew several survey lines on large maps, delineating how the ship will conduct the geophysical survey across the extent of what is believed to be the suture zone. The majority of surveying will be near the coastline ( as close as we can get) since a tracing of the terrestrial fault continues into the bay near to shore. We also have no idea where the coral reefs are, since no documented reef surveys are neither available or have been conducted. Since the fault is likely near the coastline, this is also a likely location for corals. We may try to collect some coral samples to date them and determine if they can provide us with any information on recent earthquake activity. Our ETA is saturday afternoon (12?). We will first drop the tents, then deliver some supplies to a geologist working on the faults on the land, pick up 2 haitian geologists, then begin the surveying. 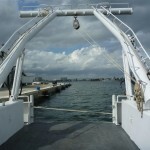 The tents will be transferred from our boat to a barge-like ship using a crane. 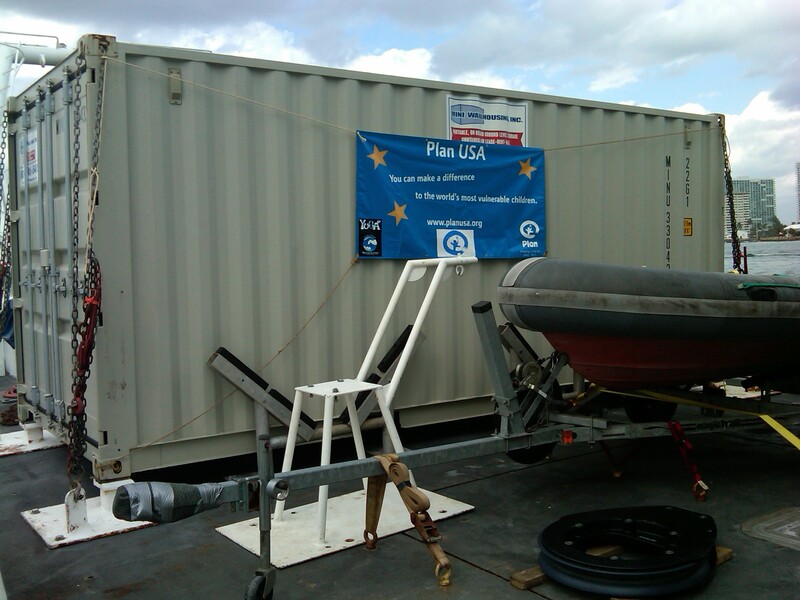 To bring the supplies for the onshore geologist, a few member of our team will travel by a zodiac boat (inflatable motor boat), which will also be used to pick up the Haitian geologists. This may also be the day when national geographic (or NOVA) will be joining us. The Discovery Channel clip is now available online. Dr. Cecilia McHugh, research scientist at Lamont and faculty at Queens College, is featured and answers questions. Columbia University also has a great page explaining the geology of the Jan 12 Earthquake and the importance of the research cruise. 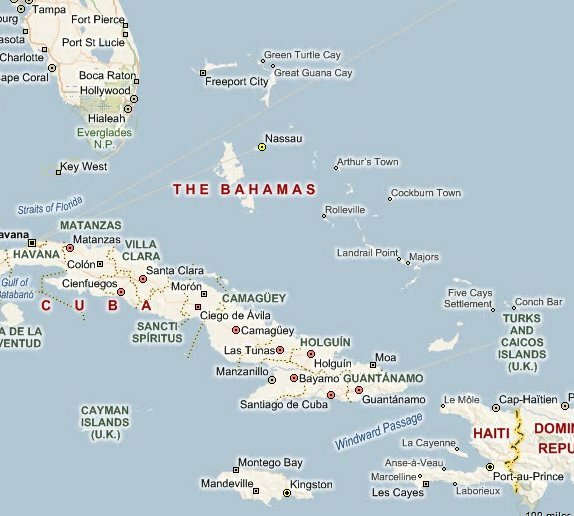 I’ve just received a short message from Katie that they have reached the Bahamas, and look to be about 1/4 of the way to Haiti. 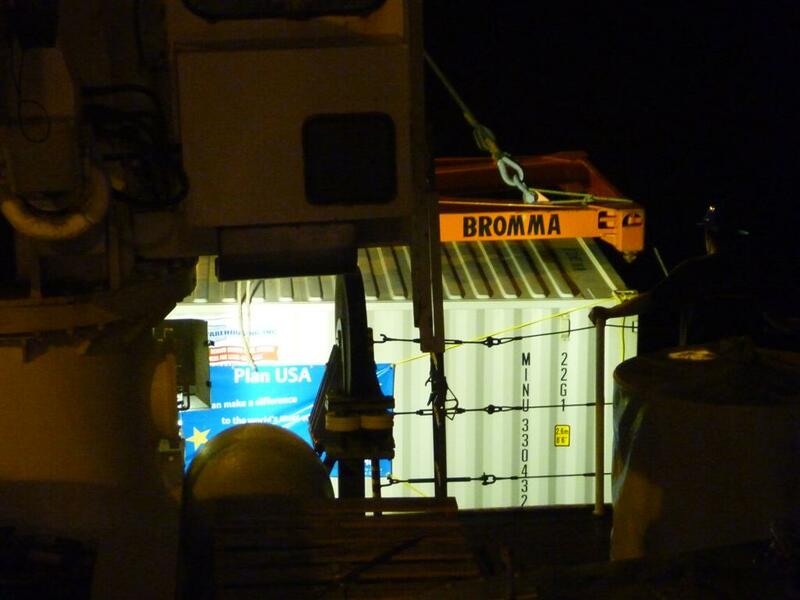 After securing all potential moving parts securely to the boat, we departed at around 2pm today (Feb 24). 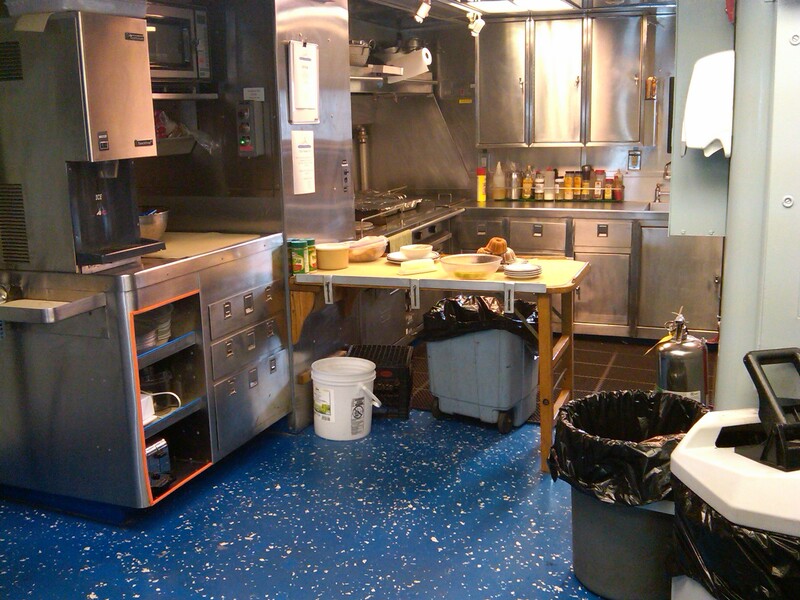 We had a meeting where we discussed safety procedures and our work shifts. We are working four hours at a time with 8 hour periods between shifts. My shifts are from 4-8 am and pm. However, once we start coring, we will likely begin 12 hour days. Nicole (another graduate student) and I worked together prepping all the coring equipment and testing cylinders to ensure they fit correctly in the corer. 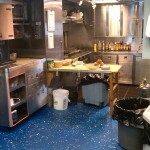 We also worked to get the wet lab organized for when we begin coring to ensure everything is in proper order. We intend to use 2 types of coring equipment: a multicoring, which collects four cores at once each with a length from 0.5 to 1 m, and a gravity corer, which is used to collect one 8 ft long core. 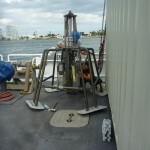 After each coring run, the cores will be brought to the wet lab for processing. The short multi-cores will be photographed and split into 1-2 cm intervals and then placed in bags for further analysis at Queens College. 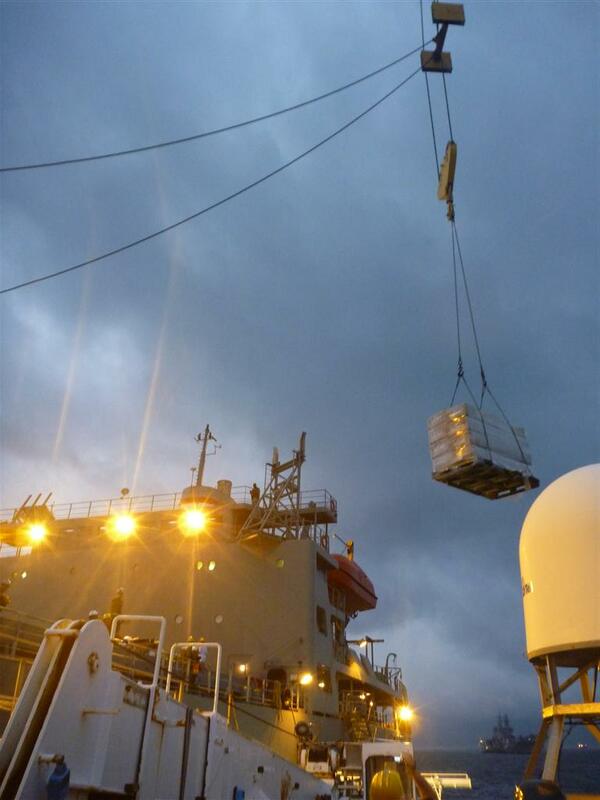 The long 8 ft cores will be transported in their original cylinders to Lamont where we will analyze them for geophysical properties (p-wave density, bulk density, magnetic susceptibility) I will add pictures of all this equipment. Currently we are sitting about 30 miles east of southern florida as we attempt to test the various equipment pieces to ensure everything is working correctly. 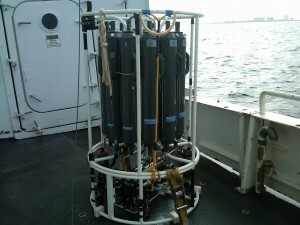 Today, we did a a test run of the CTD (picture included). CTD stands for conductivity (a way to measure salinity), temperature, and depth and is passed over the starboard side of the ship. 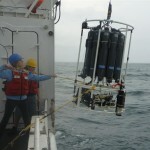 It is lowered to near seafloor depths as it collects continuous measurements of temperature, depth, and conductivity. The very bottom of the apparatus is what collects these measurements. 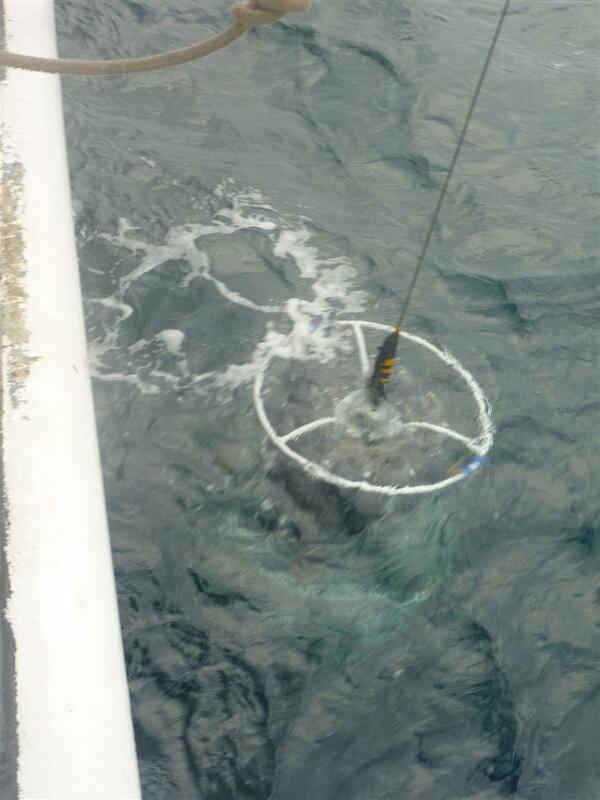 There is also a ring of water bottles which is used to collect water samples whenever it is triggered. 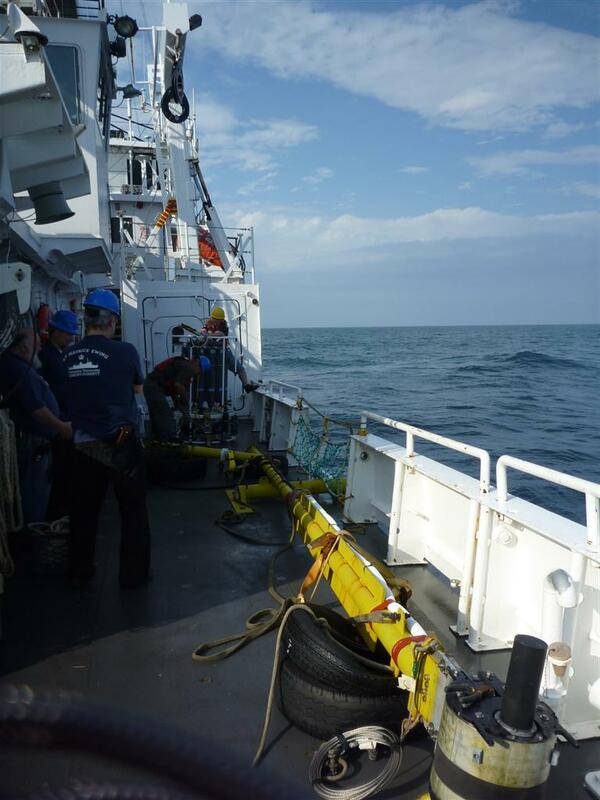 If we do choose to collect water samples, we will learn what would be ideal depths as we lower the ctd toward the seafloor. When we raise the ctd toward the surface, we will trigger certain bottles to capture water samples at depths of our choice. You may have noticed the picture of the computer lab. 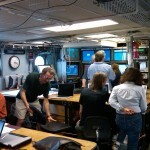 The computer labled CTD is where we instantaneously observe CTD measurements as it is lowered to the seafloor. 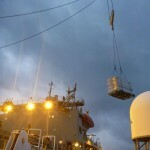 Although it is mechanically lowered toward the sea bottom as well as lifted through the water column, the CTD requires considerable manual labor to ensure that its rise above the shift edge and return to the deck is smooth and does not damage the equipment. 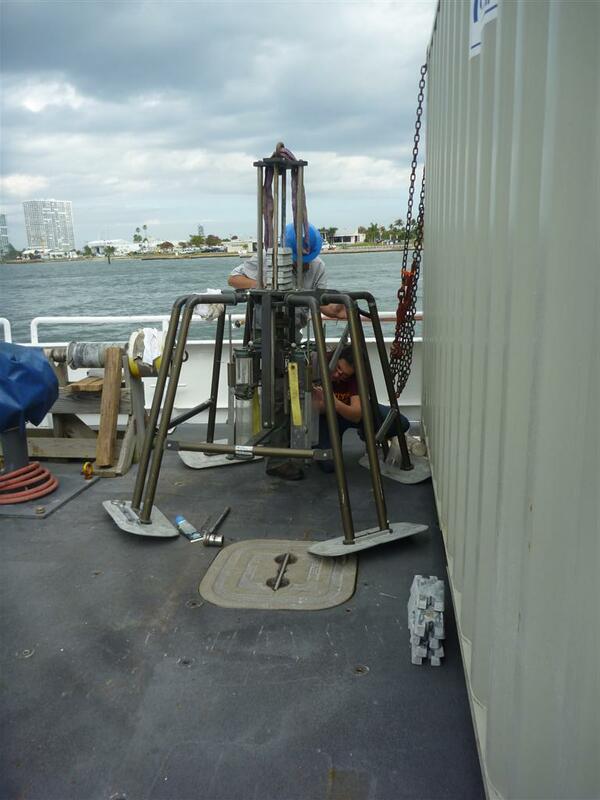 It is important to collect CTD measurements frequently and especially when we begin coring because we want to gather as much information as we can about a particular site in order to best understand its physical properties. As we begin to utilize the multi-beam, side-scan sonar, and the chirp, I will provide a more detailed explanation regarding their utility for understanding the dynamics of the seafloor. As we were increasing distance from the Florida coast, we were surrounded by dolphins. It was beautiful. 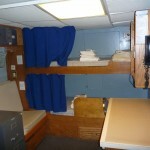 We safely arrived and began our work on the RV endeavor while stationed at dock. 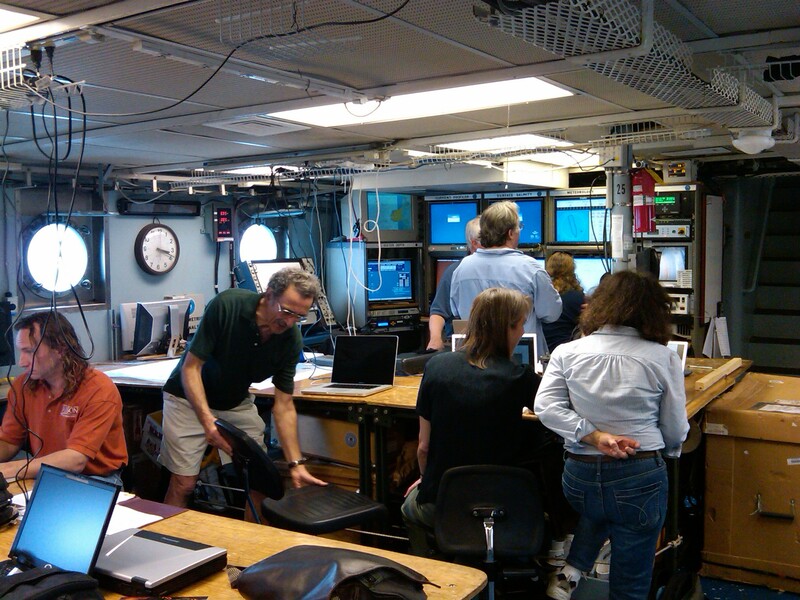 So far there have been several meetings including the scientists and crew members so we can collaborate and discuss how best to achieve our scientific goals considering the technical logistics (I.e. Speed of the boat while collecting geophysical data, do we need to worry about losing our equipment in a lobster trap, how best do we approach the hypothesized fault lines, ect.). 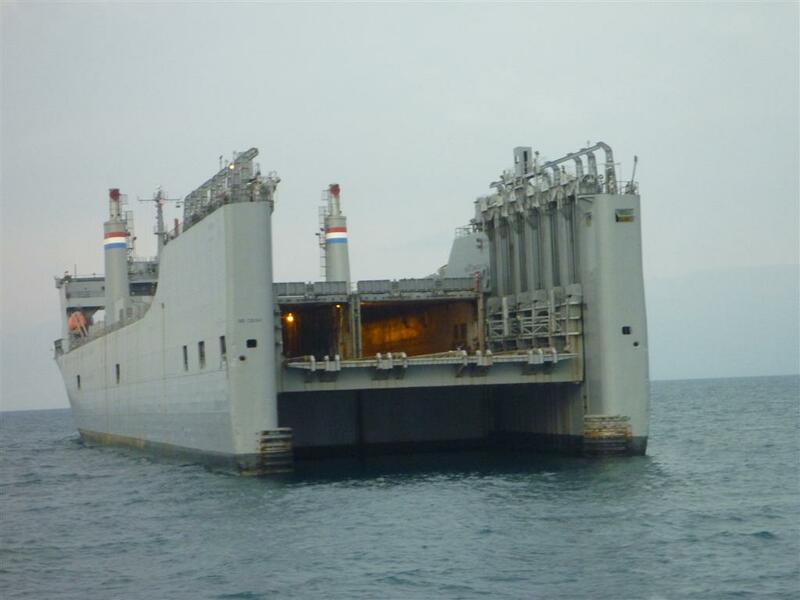 We may be delayed leaving port (scheduled tomorrow) because a critical component, the CHIRP, which provides an image of the seafloor and its subsurface, has arrived but fedex said they can’t find a worker who can get clearance to enter the shipyard until the morning. 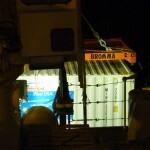 Hopefully we can calibrate it and still be able to leave by morning. 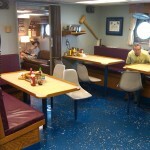 Discovery came on board to film us prepping. 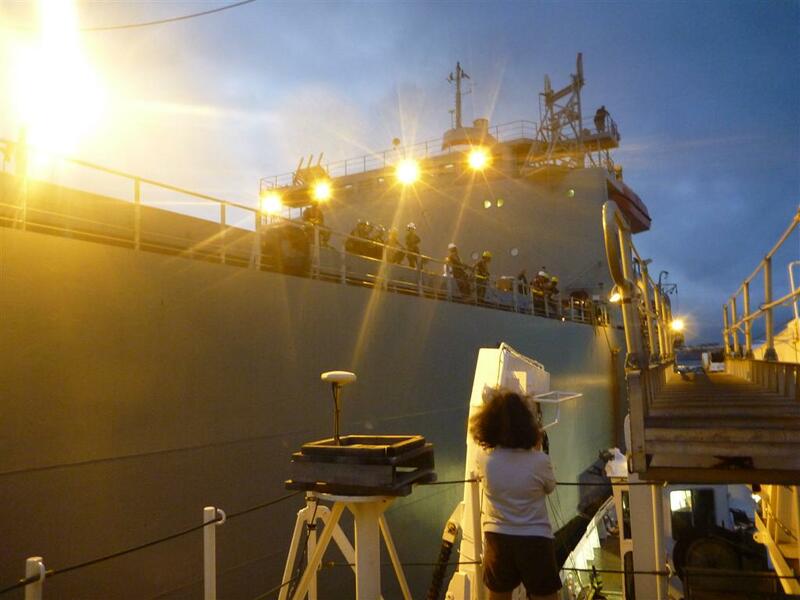 Cecilia McHugh and a few others were interviewed about our expedition. 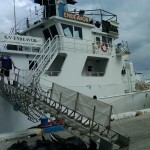 Hopefully we depart for haiti tomorrow. 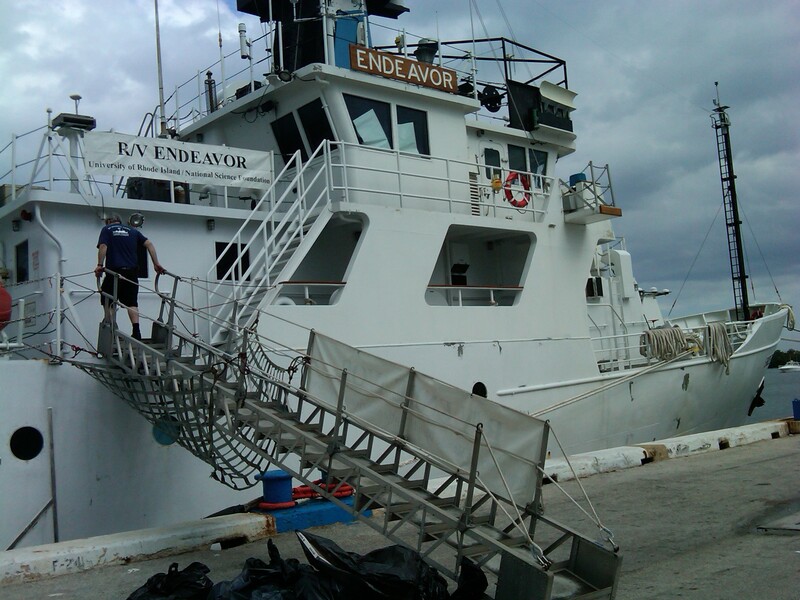 Katie will be leaving shortly for an adventure around Haiti aboard the RV Endeavor! 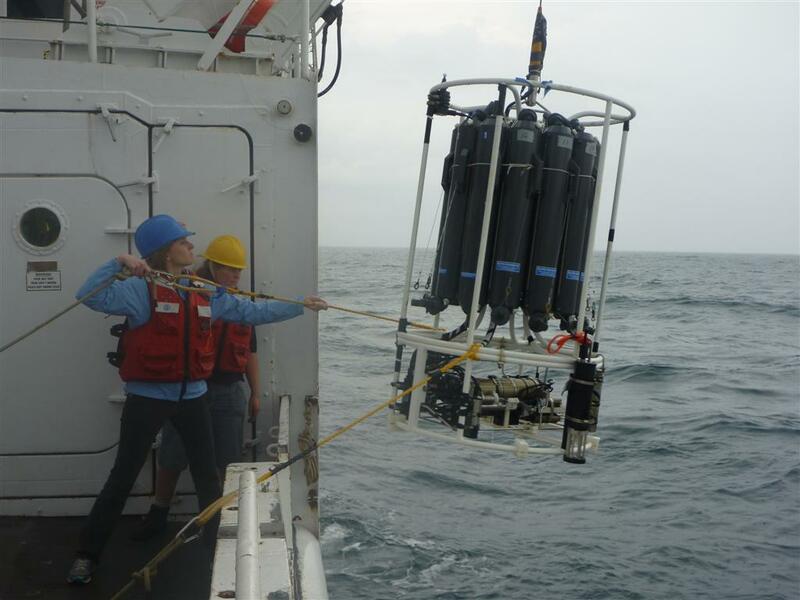 She’ll be collecting sediment cores in hopes of identifying a recurrence interval of past earthquakes in order to predict future events. This expedition will also involve extensively mapping the fault zone using high-resolution geophysical equipment and trapping gases that are seeping from the fault zones. Ideally this project will be a small part of her dissertation. Hopefully the internet connection I set up will work and she’ll be able to stay in touch via this blog. The map below should automatically update with the boat’s location. Feel free to post comments and Katie will try to get back to you.